Ian Poulter, the 2008 Open Championship runner-up, came through final qualifying to reach this year's tournament at Royal Birkdale. The Englishman, ranked 83rd in the world, tied for second at his home club Woburn to qualify alongside Toby Tree and winner Shiv Kapur. "Going back to Birkdale after what happened in 2008 is special," said 41-year-old Poulter. The Open will take place from 20-23 July. 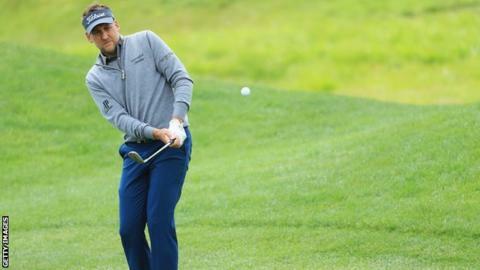 Ryder Cup veteran Poulter was in danger of losing his PGA Tour card this year because he failed to earn the required points or prize money in the 10 events covered by his medical exemption following a foot injury. However, a rule change allowed him to retain it for the remainder of the season. Five events were held across the UK to fill the final 15 places at the Open. At Gailes Links in Ayrshire, 21-year-old Scottish amateur Connor Syme on four under par shared top spot with American Julian Suri, with Australia's Ryan McCarthy taking the last place after a four-man play-off. England's Matthew Southgate booked his ticket for the third time in four years thanks to a second straight victory at Royal Cinque Ports in Kent. Rounds of 71 and 65 saw Southgate finish three shots clear of Robert Dinwiddie, with Canada's Austin Connelly claiming the final place after a four-man play-off. Haydn McCullen, 20, carded a course record of 64 to lead an English one-two-three at Hillside in Southport ahead of Nicholas McCarthy and Adam Hodkinson. There were three more English qualifiers at Notts Hollinwell after Mark Foster and Joe Dean tied for first on 10 under par and Laurie Canter emerged from a three-man play-off on seven under.